Ingoldsthorpe at Ingoldisthorpe01485 532610work VillageThe village of Ingoldisthorpe in 9 miles north of King’s Lynn and 7 miles south of Hunstanton. The village has a post office and an impressive church, St Michael’s, which was almost entirely re-built in the 14th century and then subject to a comprehensive restoration programme in the mid19th century. It is particularly notable for its stunning collection of late 19th and early 20th century glass. 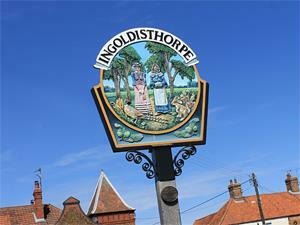 The village of Ingoldisthorpe in 9 miles north of King’s Lynn and 7 miles south of Hunstanton. The village has a post office and an impressive church, St Michael’s, which was almost entirely re-built in the 14th century and then subject to a comprehensive restoration programme in the mid19th century. It is particularly notable for its stunning collection of late 19th and early 20th century glass. Surrounded by rolling countryside, yet easily accessible to many parts of West Norfolk, Ingoldisthorpe is also situated on the National Cycle Route 1. The village is also ideally situated for visiting nearby attractions including Sandringham House and the beautiful Sandringham Estate, Snettisham Park and Norfolk Lavender as well as the beaches at Heacham and Hunstanton.